Spinach is one of the vegetables from our list of easiest to grow vegetables. It is very easy to grow and maintain. 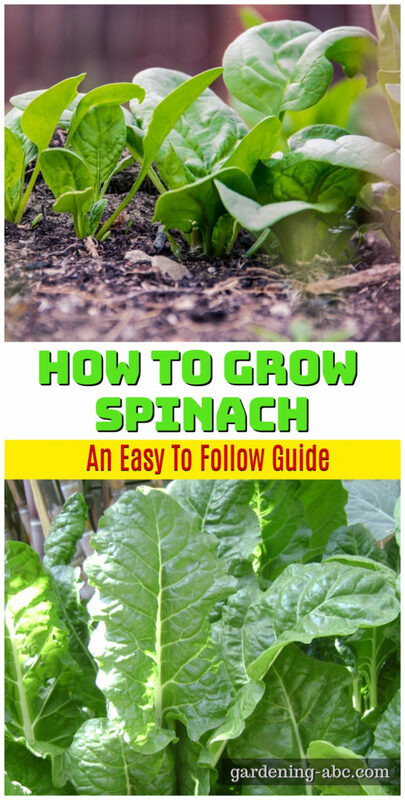 Here in this article, we will discuss How to grow spinach. Though spinach is famous for iron, there are several other elements which are far more in spinach than the iron. Vitamin A and K are more abundant in spinach. If you want to take the best of iron from spinach add some slices of oranges to increase the absorption. Spinach is a winter crop. Some variety can even survive frosts also. It can mature within a month or so. Though it requires full sun, too much heat can result in early bolting of the spinach. The ideal pH for spinach is 6.5 to 7. Add lime to reduce the acidic nature of the soil in case pH is less than this level. Mix compost along with water prior to planting the seeds. Put the seeds ½ inch deep and at 2 inches space. It is wise to plant spinach with a little space in between. This can prevent many problems due to moisture in the air. If you are using container planting you can put 3 seeds per pot with a minimum gap of 1 inch. DO NOT grow spinach in the same soil where beets, or, chard has grown earlier. These have similar requirements from the soil and also they are nest to the same kind of parasites as of spinach. When the plant reaches a size 1/3 of its full height, You can add nitrogen-rich fertilizers to the soil. You can also avoid fertilizers if you had added enough compost at the start. Water the plant regularly. Mulching is a good idea to restore soil moisture. When seedlings sprout to about two inches, thin them to 3-4 inches apart. After about six weeks of planting pinch off leaves for your kitchen purpose but keep the central structure intact. These will produce seeds in the later stages. In case you do not require seeds you can pull out the whole plant. Cliff off any leaf which turned yellow. This will increase the flow of sap to the main plant and the other healthy leaves. Don’t wait too long for harvesting. After maturity, the leaves will turn bitter. You can either take out the leaves from the plant or you can cut the whole plant near the roots and enjoy your spinach with your family. By growing spinach in your own house you can be rest assure about the quality of the fertilizers. To get greater yield chemical fertilizers and pesticides are applied continuously these days. It is always better to avoid that spinach. The famous cartoon character Popeye have made spinach very popular among the children. Though you will not get the instant gratification of building up large muscles, its benefits are definitely worth mentioning. There are so many benefits of eating spinach. You can eat them both cooked or raw. It helps to prevent osteoporosis, fighting against cancer and heart diseases. And last but not least it will definitely add flavor to the taste buds.